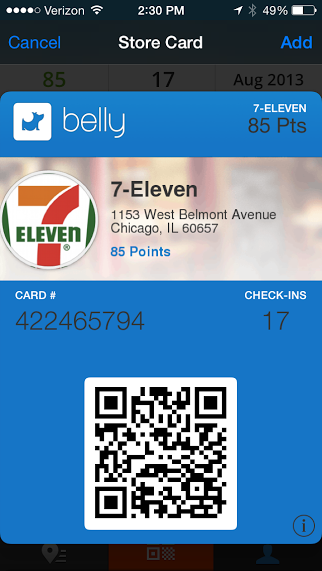 Given 7-Eleven participated in digital loyalty startup Belly’s most recent $12 million funding round, you would figure the convenience store giant was bound to start installing Belly’s iPad rewards terminals in retail locations around the country. Well, that roll-out begins began this month, and by the end of this year 2,600 7-Eleven stores in North America will start awarding points and handing out free cups of coffee and Slurpees to Belly’s growing user base. Belly started out in Chicago as a rewards program for small businesses that didn’t have the resources to create their own amenity programs. Instead of joining a bunch of individual loyalty programs, customers just signed up for one, [company]Belly[/company], using its app to check into iPad terminals at any participating business. Each check-in accrues a certain number of points, which can be exchanged for goods or services determined by the retailer that awarded them, for instance a free appetizer at a restaurant or an invitation to an exclusive wine-tasting at a liquor store. But in 2013, Belly began attracting the interest of several big national retail and restaurant chains. Its iPads began popping up in [company]McDonalds[/company], [company]Chick-fil-As[/company] and 7-Elevens around Chicago. [company]7-Eleven[/company] launched in 85 Chicago store originally, but it expanded its pilot of Austin and Los Angeles. Earlier this month 7-Eleven began to install Belly’s terminals in 465 new locations in New York City and Vancouver and by the end of the year it plans to have the program active in 2,600 stores, representing a quarter of its stores in the U.S. and Canada. I’ve used the Belly app in many a Chicago 7-Eleven, which isn’t hard to do considering they’re almost as numerous as bars in the Windy City, and I have to say that the Belly model works well in a convenience store. Every three to five visits or so you can get a free coffee or a complimentary snack such as a banana. But as Belly becomes more corporate, I’ve also noticed that the small businesses that it previously focused on seem to be leaving or neglecting the program. Our neighborhood wine store stopped accepting Belly one day, while one of our favorite restaurants increasingly started leaving their Belly terminal off. Belly founder and CEO Logan LaHive told that my experiences with Belly in Chicago don’t paint the whole picture of Belly’s overall traction with small businesses. While Belly does see some businesses leave the network after their initial year-contract is up, it’s churn rate has been decreasing every quarter and the average check-in rate at its businesses have been increasing daily as more people download its app, LaHive said. He added that Belly is on pace to be 10,000 business locations by the end of the year. It’s true there are still a lot of local businesses that use Belly here in Chicago, but most of the new Belly terminals I see popping up seem to be in 7-Elevens than in mom-and-pop stores and diners. Chances are those big retail chains represent a much more profitable market for Belly, which is fine, but in my opinion it also makes Belly a lot less interesting. Belly’s local businesses have come up with some fairly unique rewards like a free cooking lesson from the chef of a neighborhood bistro or a local pet store’s offer to hand-sketch a portrait of your dog. Quick and dirty way to get more people to use your app. Well, I was going through this Belly loyalty application, and it does show a lot of promise. Wonder how this would pick up in Asia. It really gives me that Grab Taxi vibe of linking up commuters with taxi drivers. Simple and affordable way to get started with your own loyalty programme if you are a merchant.